FOCUS TRANSPORT: IS IT THE END OF THE ROYAL LINE? Even the angriest class warrior would be hard-pushed to call it luxurious. With the ambiance of a mid-range provincial hotel circa 1975, it has a homely simplicity, but it is no palace on wheels. Formica panels, Fifties-style G-plan furniture, plastic baths and strip lights (no chandeliers here) would hardly lend themselves to an Agatha Christie-style whodunnit — unless, perhaps, one was filming Murder On The Leyton Orient Express. It is also the slowest inter-city rail service in Britain. But there is no other train on the planet that comes close in terms of charm, punctuality and eccentricity — let alone history. That is why rail buffs and trainspotters will not be the only ones dismayed by the news the Royal Train could be heading for the buffers. And none will be sadder than the Queen and her family. This week, Sir Alan Reid, the Keeper of the Privy Purse — the financial director of the royal household — appeared before the MPs on the Public Affairs Select Committee to discuss the state of the royal finances. While public finances may have ballooned, the Monarchy has managed to halve its costs over the past 20 years. But its admirable policy of ‘make do and mend’ cannot go on indefinitely. At Buckingham Palace, the 60-year-old boilers are pushing up the fuel bills, the wiring hasn’t been touched since George VI was on the throne, bits of masonry are falling off and buckets have to be strategically placed under holes in the roof. With all this alarming news to absorb, the MPs barely noticed Sir Alan’s additional disclosure that the Royal Train is in similar need of repair. In a few years, a ‘major decision’ will be required regarding the Seventies rolling stock. And it will be an expensive one. ‘The figures’, this astute former international financier added, ‘are quite staggering’. There is no question that Buckingham Palace and Windsor Castle must be properly restored. They are two of the most famous buildings in the world, national landmarks which belong to the nation, not the Queen. But there will be less sympathy for the Royal Train. And Sir Alan’s reference to the ‘staggering’ cost of a new one suggests that he already knows it’s a non-starter. In which case, the Royal Train seems destined to follow the dear old royal yacht, Britannia, in to retirement. And while that may please modernisers and republicans, royalists like me will regard it as a crying shame. The vast majority of royal rail journeys involve scheduled services. But the Royal Train has its uses. Critics always focus on the headline figure of the train — £1 million a year to run, or £20,000, say, for a trip to Scotland — without acknowledging the advantages of a royal mobile home. It’s extremely secure, it can accommodate all the paraphernalia of a royal tour and, unlike the alternatives, it is virtually foolproof. If a whole county is waiting to see the Queen, then a whole county will be let down if her helicopter is grounded by fog or her car gets stuck in traffic. 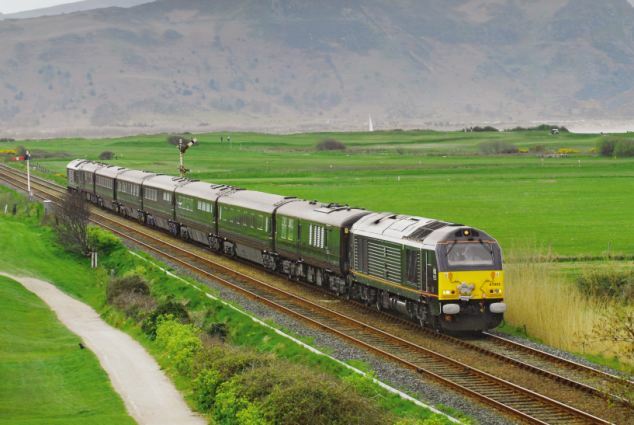 Thanks to the Royal Train, everyone knows that she will be in Swansea or Lincoln or Ayr to the nearest ten seconds (though Royal Train drivers try to stick to a five-second margin of error). As for the Royal Family themselves, it really is the proverbial home-from-home — familiar staff, a favourite armchair, the same old tea cups. An abiding memory of my only tour inside — during the 2002 Golden Jubilee — are the boxes of Tesco tissues on the royal tables. When not in use, it all sits in a large railway shed at Wolverton, near Milton Keynes, where a skeleton crew keep the nine claret-coloured carriages and their contents in mint condition. Not that they are called carriages. They are ‘saloons’. 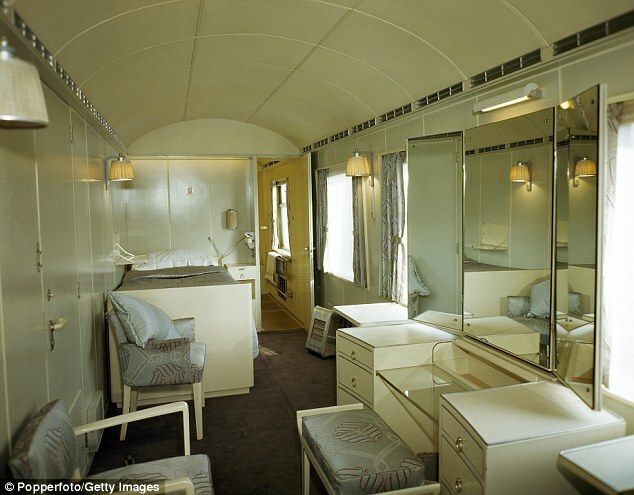 The Queen, the Duke of Edinburgh and the Prince of Wales each have their own saloon while additional wagons, looking much like regular sleepers and First Class carriages, feed and accommodate the staff. There is no permanent royal locomotive, although the operator, DB Schenker, will only hitch one of its classier models to the royal rolling stock. And since 2007, the Royal Train is powered by eco-friendly bio-fuel. 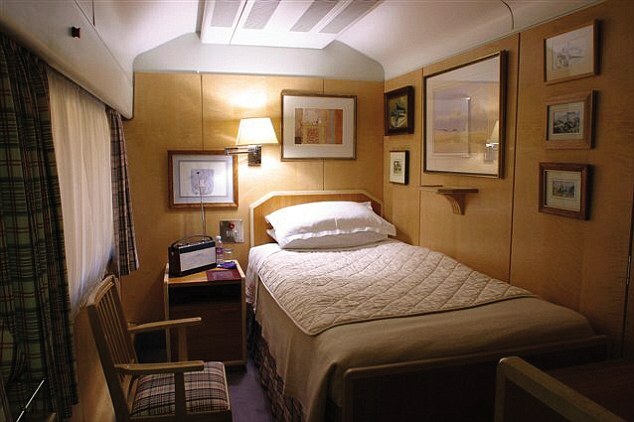 Royal passengers sleep in single beds which run lengthways behind a partition in the centre of the carriage (for optimum stability and a good night’s sleep). All the other bunks lie across the carriage, as in a conventional sleeper. The Queen has a bath in her carriage while the Duke of Edinburgh prefers a shower — and keeps a blown-up image of his first Senior Citizen’s Railcard alongside a chunk of Brunel’s original broad gauge. Charles keeps a handmade pot-pourri holder, presented long ago by a girl in Haverfordwest, next to his bed and a picture of Britannia above it. As well he might. The similarities with Britannia are everywhere — from the plain furniture and antiquated telephones to the absence of double beds (if the Duchess of Cornwall is on board, she has her own saloon — complete with pink bathroom). As Brian Hoey points out in his fascinating book, The Royal Train, when Edward VII became King, he stipulated it should ‘be as much like the royal yacht as possible’. 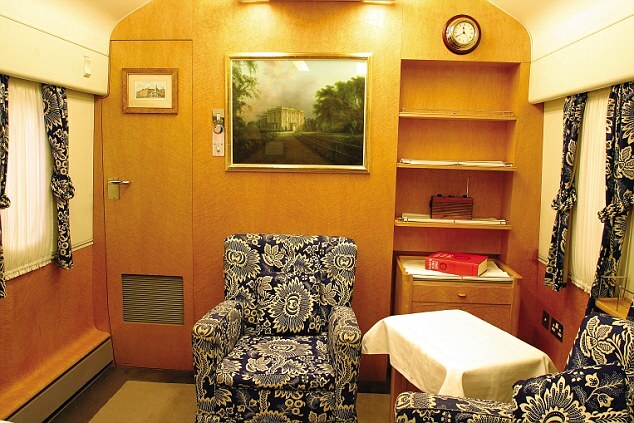 The current Royal Train dates back to the 1977 Silver Jubilee. Then, it consisted of 14 carriages for the use of all the senior members of the family. Sometimes two trains would be in action. On one day in 1986, no less than three could be seen in different parts of the country. By the late Nineties, cost-cutting had reduced the number of wagons to nine and royal use was restricted to the Queen, the Duke of Edinburgh and the Prince of Wales. None of them has ever been as demanding as the earliest royal passengers. Queen Victoria was the first monarch to board a train when she made the journey from Slough to Paddington in 1842. Brunel himself was on the footplate. 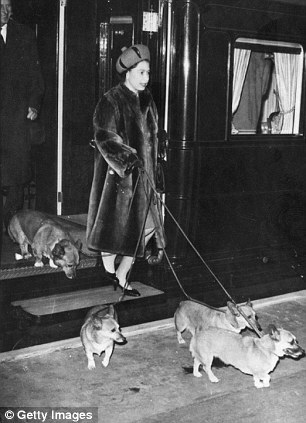 To general relief, Her Majesty much enjoyed the experience and was soon making her mark on Britain’s rail network. Having decreed she would neither eat nor go to the lavatory on board, lavish ‘refreshment’ buildings were built along the route north to Scotland. Victoria commissioned the wagons which became the first Royal Train. While Prince Albert invented the first train lavatory, George V went one better and was the first person in the world to install a bath on a train. It was 1915, the nation was at war and he wanted to tour Britain without descending on the nearest country house each night and causing mayhem. In time, Queen Mary became a convert to the 55in bath, though she imposed a speed limit of 5mph when sitting in it. 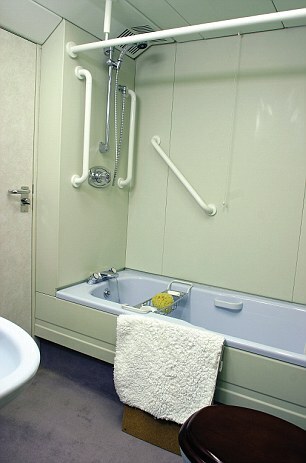 A full-size bath was installed in 1941 as George VI and Queen Elizabeth began extended wartime tours of the country by rail. By the end of the war, it was calculated they had travelled 63,000 miles. But distance is only half of the story. Now, as then, royal passengers spend a lot of their time at a standstill. In order to avoid any inconvenience to regular rail services, the train will meander along branch lines and wait until the main services have ceased before taking to the major routes. When it is reasonably near its destination for the following morning, it then parks in a secure siding until dawn. The driver — drawn from a pool of 50 — will then begin a stately progress to the final destination. Drivers pride themselves on a jolt-free ride, just as the on-board chef takes great delight in preparing the scrambled eggs and bacon exactly the way the Queen likes them. Most of us will never even see inside this thing, let alone travel in it. But, as with Britannia, that does not stop us taking great pride in a classic piece of romantic, understated British elegance. But for how much longer? It will certainly be a sad day when there is no longer a claret-coloured saloon carrying the head of state across the nation which invented the train in the first place.